Second-half goals from Sadio Mane and Mohamed Salah secured a 2-0 win at Anfield that took the Reds back above Manchester City, who beat Crystal Palace earlier on Sunday. Liverpool, in pursuit of a first title since 1990, lead by two points with four to play, although City do have a game in hand. Manager Klopp said: “We controlled and dominated the game for 80 minutes, which is the best you can say about a game against Chelsea. “In those 10 minutes they could have changed the game completely—a post and two saves from [Alisson]—but then we controlled the game again. 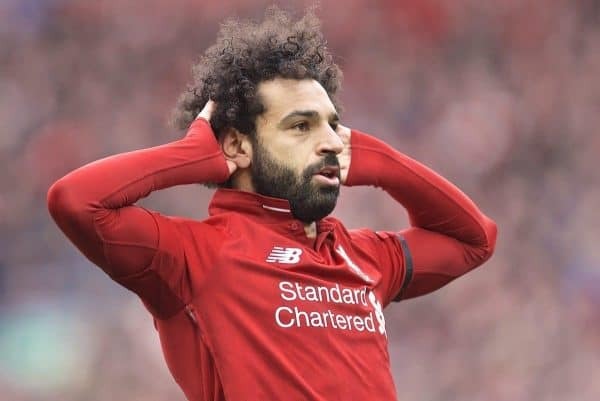 Asked about Salah’s goal, Klopp said: “It blew me away. It was a really, really outstanding finish. I don’t want to minimise that but I [also] loved the first goal—good team play, good cross, good header. The German said: “What we want to do is collect as many points as possible. That’s 85 points now, so with four games to play that means [we can get] 97. “Let’s try that and if that’s enough, perfect. If it’s not we cannot change it. We didn’t lose it here or there. Klopp also hoped the result would draw a line under reminders of Steven Gerrard’s slip against Chelsea last time Liverpool were chasing the title in 2014. That incident featured in a number of previews for the game. Coincidentally former captain Gerrard, who is now Rangers manager, visited Liverpool’s training ground on Friday. Chelsea head coach Maurizio Sarri, whose side hit the woodwork through Eden Hazard in the second half, felt the visitors were unlucky not to get something out of the game. 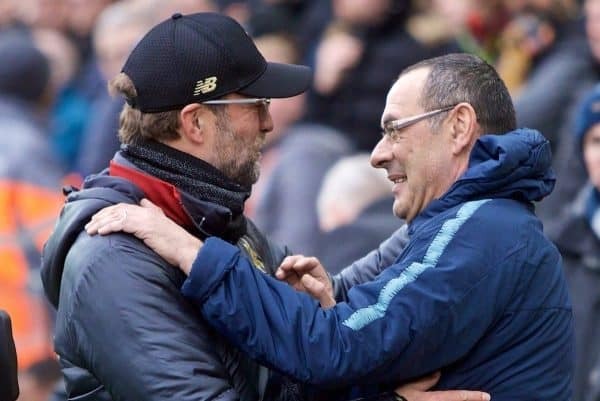 Sarri said: “Liverpool are one of the best teams in Europe at this moment. They played very well for 90 minutes but I think we stayed in the match very well. “We were a little bit unlucky for the timing of the second goal, and then a little bit unlucky because in three minutes we had three goal opportunities—two with Hazard and one with Higuain. We hit the post number 35 of our season.